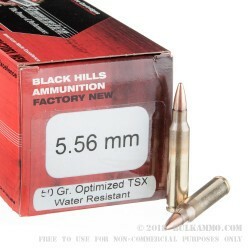 An effective load for hunting a wide variety of small to midsize game, this 5.56 NATO ammunition from Black Hills Ammunition is a great choice for rifles based on the AR-15 and other .223/5.56 platforms. 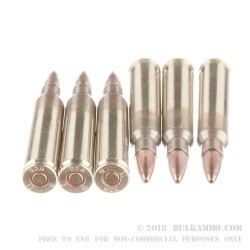 This ammo is also effective against both two and four-legged assailants, making it an excellent all-round choice to have on hand. 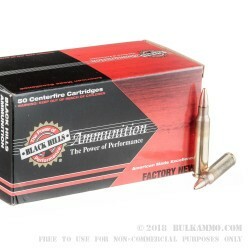 Each cartridge in this 50-round box fires a 50 grain Barnes TSX jacketed hollow point bullet at 3,275 feet per second. The TSX is a solid copper design with a groove that reduces chamber pressures and fouling while delivering high diameter expansion against game. Black Hills ammo is made in Rapid City, South Dakota using non-corrosive primers and brass cases. BHA is one of the nation's best-known producers of high-end 5.56 NATO ammunition and fulfills contracts for all branches of the US military.